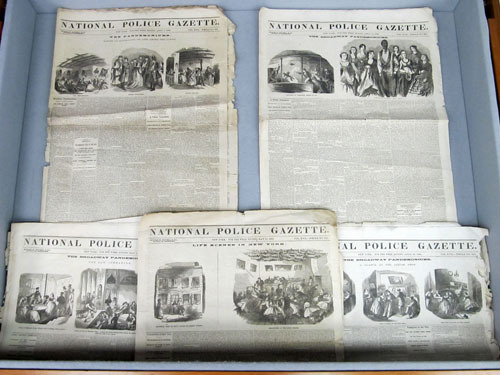 The National Police Gazette out of New York City was published from 1845 through 1977, producing some 5,000 issues of this notorious scandal sheet. It reached its zenith in the last quarter of the nineteenth century, serving as a model for lurid and sensational forms of tabloid journalism, gossip columns, and separate sports pages that eventually eclipsed it and are still in evidence today. 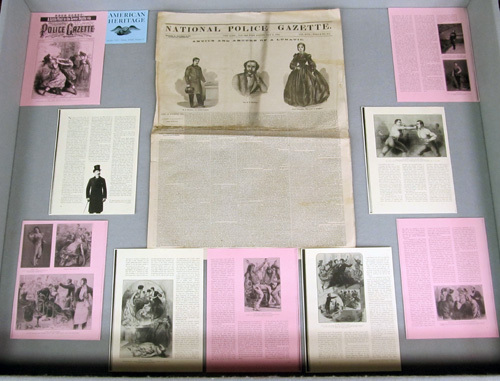 On display in the New York State Library in May 2012 were some highly rare original examples from the 1860s. They carry such colorful headlines as "Antics and Amours of a Lunatic," "Public Brothels Abrogated," "A Glance at the Liquor Pens," and "Vampyres in the City." One wonders how they came to the Library, and if they survived the 1911 Capitol Fire or were added later. One of the artifacts carries an early distributor's rubber stamp that reads, "P.L. 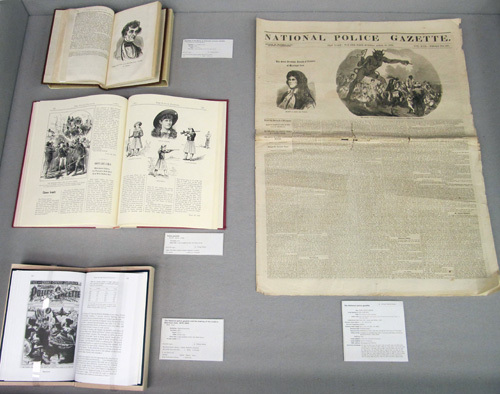 Gilbert, CHEAP / Publication & News Depot, Agent for the American Machine Stamp Co. / Museum Buildings, Albany, N.Y."
Also on display were some related books by or about the National Police Gazette from the collection.